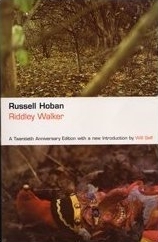 Russell Hoban's seminal masterpiece Riddley Walker was published 30 years ago this year. To celebrate this, SA4QE invites fans of the novel to participate in a special SA4QE on 5 November, by leaving your favourite quote(s) from the book in a public place, and/or sharing it online such as by posting it as your Facebook status update for the day, or tweeting or blogging it. Why "extraordinary"? Every SA4QE is of course extraordinary but it usually takes place on 4 February each year in celebration of Russell Hoban's birthday. A break with this tradition doesn't seem too outrageous given the recognised position of Riddley Walker both in Hoban's oeuvre and in late 20th-century literature. What do I have to do? Basically just pick a favourite quote from the book, write it on a piece of paper and leave it somewhere for others to find. Full guidelines for taking part in this or any SA4QE, and sharing your selections with this site, can be found on the Contribute page. Also of interest: Russell Hoban is being interviewed before an audience in London on 22 November about Riddley Walker as part of the Guardian Book Club series. At the time of writing tickets are still available. The novel is also the Guardian's Book Club book for November, so keep an eye on their website and/or buy the Guardian on Saturdays throughout the month. Below is a link to my blog, Fred's Place, where I've posted a few quotations from _Riddley Walker_.